My poor little blog. How I’ve neglected you so! I really do feel bad about not posting in over a week (only a week? It feels like it’s been a lot longer), but I had absolutely no control over what’s been happening to my body. You see, during finals week, I came down with the flu. 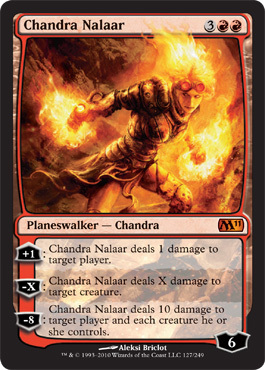 2) However, said generous friend bought himself the blue and white Intro Deck, and in his Booster Pack he ended up with Chandra Nalaar. Namely, the Planeswalker for my deck, which a super-mega-ultra-rare-made-of-awesome card. So, yes. Hopefully I’ll recover from this awful plague cold (and everyone around me will start using hand sanitizer 24/7 for the next four months), and I hope everyone has a wonderful plague-free holiday season.